Are your symptoms indicative of TMD? While the cause of TMD is not clear, dentists believe the symptoms begin with problems of the jaw muscles or parts of the jaw joint. 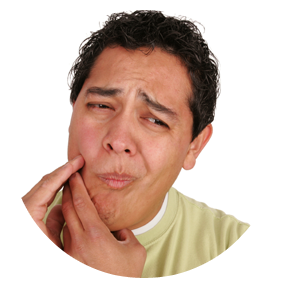 A heavy blow or whiplash affecting the jaw, temporomandibular joint, or muscles of the head and neck might cause TMD. Computerized jaw tracking instruments to record jaw movement, resting position, and path of closure to pinpoint the cause of your TMD and develop an effective treatment plan. Electromyography to measure your jaw’s muscle function in stressed and relaxed positions, as well as measuring the jaw-to-skull relationship for structural imbalances. Sonography to record jaw joint sounds and detect abnormalities. X-rays of your jaw to evaluate the condition and positioning of your temporomandibular joint. Why is it important to choose an LVI-trained neuromuscular dentist? Las Vegas Institute for Advanced Dental Studies is the premier training facility for neuromuscular dentists. LVI-trained neuromuscular dentists are specially trained to recognize signs of TMJ and to provide the best care for each patient. Now that you know what TMD is, isn’t it time to schedule your free consultation with Dr. Mathew to find out if TMD is the cause of your symptoms? Please contact us today at Artisan Dentistry, Salem New Hampshire and Newburyport, Massachusetts to schedule your consultation. A whole new pain-free life awaits!